After our last bike event a few weeks ago, when we supported the poorly attended ‘Skylark Bike + Truck + Rock festival’, this past Sunday saw our fortunes transformed from famine to feast at this years ‘Herts Bikefest’. 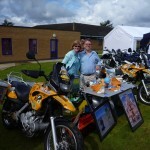 Organised by Hertfordshire Fire and Rescue and taking place in our home-town of Stevenage, the event has been growing over the past few years and is now a firm fixture on the local motorcycling calendar. A reasonable weather prediction for the day, a bit of decent promotion beforehand and with celebs such as Guy Martin, Austin Vince and, of course, a couple of Leprechauns in attendance they had all the ingredients for a great day out. Thousands of riders turned up to support the event, mooch the many trade-stalls and be entertained by stunt-rider Sparky doing amazing things on his sportsbikes in the centre-arena. At one point it looked like Guy Martin was approaching our stand. Maybe he would show interest in one of our ‘Adventures in Yellow’ books?…. Turned out he was more attracted to our neighbours with the pink gazebo; ‘Curvy Riders MCC’ a club for lady bikers. Herts Bikefest was a brilliant, relaxing day out with the added advantage of raising a load of cash for the ‘Help for Heroes’ and the ‘Fire-fighters’ charities. Thanks to all who made it happen and looking forward to seeing you all at this not-to-be-missed event next year! ← Success at St Albans Waterstone’s!